“If we are to avoid the worst we must speed up our actions,” European Council President Donald Tusk says, referring to the migration issue. 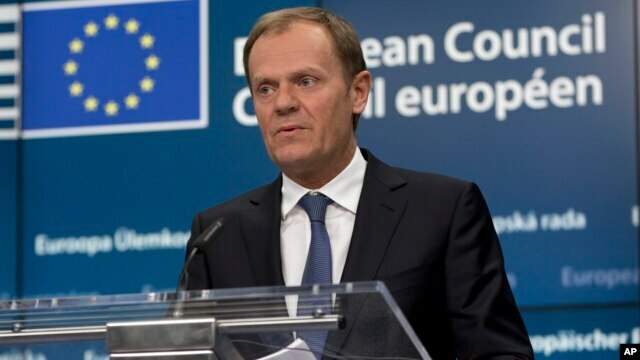 BRUSSELS — The European Union must do all it can to keep its Schengen zone of passport-free travel intact through proper management of the bloc’s external borders, European Council President Donald Tusk said Tuesday. EU leaders will discuss controlling migration with African leaders Nov. 9 in Valletta, Malta, and Tusk has called an informal meeting of EU heads of state Nov. 12. In his invitation letter to EU leaders published Tuesday, Tusk said the migrant situation was still very serious as the flow reached a record of 218,000 migrants crossing the Mediterranean Sea in October. He said the EU heads of state would assess implementation of measures decided so far, including stepping up cooperation with non-EU states such as Turkey, reinforcing capacity to receive migrants and reinforcing control of external borders.